Since my last article, I have seen many new spring arrivals in our back yard. These include Grackles, Mourning Doves, Northern Flickers, Purple Finches and Purple Martins. Killdeer, Lesser Scaup Ducks, Mallard Ducks and Snow Geese have arrived in rural areas, but can be seen flying overhead right in town. By the time this goes to print, there will be still more arrivals. This week, I want to cover a bird that is quite common, but generally overlooked and misidentified. Most surprisingly, most people do not even know the bird exists. As a youngster growing up on the farm, every farm yard had at least one nesting pair, yet nobody seemed to be aware of what they were. In this piece, I want to reveal this bird which is the only member of its family west of the Rockies – but, not just yet. For years, I have been befuddled by people reporting the sighting of a Robin-sized grey bird. Some observes even noted that the bird had some dark spots or dots on it. The description of the spots as to size, number and location were very vague and not helpful at all. Nobody seemed able to compare it to an existing bird such as a Crow, duck, Grackle or anything else. Then, I happened to be observing a flock of birds in Texas when it dawned on me what this mystery bird was. Later that spring back in Foam Lake, an eleven year old boy, an ardent birder, came to our house to look at my bird photos. When the same silhouette, as included in this week’s article, appeared on the computer screen he immediately said, “Mourning Dove”. Without hesitation, he identified it by shape alone. I do have excellent pictures of Mourning Doves, but I did want to make a point. Shape and behavior of a bird are, at times, more important than colour or size. This example is a classic! The silhouette clearly shows the bird to be a pigeon. All I would have needed to identify the mystery bird is to have had somebody say that it looked like a pigeon. Remember the old adage, “If it looks like a duck and quacks like a duck, then it probably is a duck”. In the preceding paragraph, I described the Mourning Dove as a pigeon. 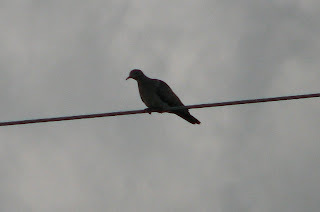 The words pigeon and dove serve no distinction in the birding world and are considered the same. Through general usage, however, dove refers to the smaller members of the group, while pigeon refers to the larger ones. There used to be three wild pigeons in Canada, but with the extinction of the Passenger Pigeon in 1914, there are now only two – the Band Tailed Pigeon of the Rockies and the Mourning Dove over most of Canada. Males and females of the pigeon family are the same. The Band Tailed Pigeon is our largest pigeon exceeding the familiar “elevator” pigeon in size. “Elevator” pigeons are feral (domestic pigeons that have turned wild). The Mourning Dove is a Robin-sized brownish grey bird with nine, or so, pea-sized black spots on the sides of its lower back and wings that are noticeable only when the bird is perched. Its “song” sounds like an owl far away which has given rise to a curious and long standing myth discussed elsewhere. Mourning Doves have two characteristics, common to all pigeons, which make them unique in the world of birds. First, they are seed eaters all the time. Unlike other seed eaters they do not feed their young animal protein. Instead, seed is digested by the parents to the point where it becomes a thick liquid, which the parents then feed to the young by regurgitation. This “soup” is known as pigeon’s milk. Second, Pigeons are the only birds (at least in North America) that have the necessary throat muscles to drink water directly like a cow or a horse. Other birds have to scoop up a beak full of water then raise their heads and let gravity pull the water down their throats. Should Mourning Doves come to your bird bath, watch how they drink. 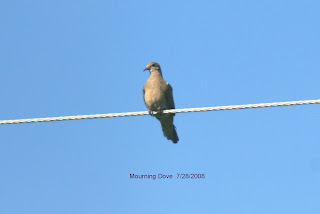 There is a very common myth surrounding Mourning Doves that I must mention. My parents and their contemporaries always predicted rain when they heard “owls” hooting in the day time. Once, when my father made this statement, I decided to find these strange owls by following the source of the sound. Instead of owls, I found two Mourning Doves cooing and billing. (It was mating season.) Mystery solved and myth busted. I do not remember if it rained. This year the Mourning Doves returned earlier than I ever recall. Every morning they can be heard cooing away in our yard right at sunrise. This is a bit early for me, but I am glad they are back. In my last article, I had written about two birds, the Bridled Titmouse and Painted Bunting, which were unexpectedly observed in Saskatchewan in the recent past. Since then I have run across another report of a very unusual sighting of a bird so far out of its range that it should not have been seen in Canada, let alone Saskatchewan – the Great Kiskadee. (I wrote about it in Article 38). The Kiskadee, which was seen in Saskatoon in 1979, is a non-migratory bird found in the extreme southern end of Texas and nowhere else in North America. It most certainly must have been an escapee or perhaps a deliberate release. In any case, confirmed sightings of such wildly located (out of place) species are considered hypothetical and are not considered official records. However, there are quite a few spring birds here already. Right now, in town, I have seen Robins, Crows, Merlins and swarms of Juncos. In rural areas Canada Geese, Bluebirds, Horned Larks and Tree Sparrows have been seen. The great thing is that there are many more to come. This week, I had hoped to write about Horned Larks or Bluebirds or Tree Sparrows, but I do not have any photos of any of these so it will have to wait. Hopefully, things will work out next year. Instead, I will offer up a few tidbits about a bird that should be here in about a week or so, and should be seen in just about everybody’s backyard in town. 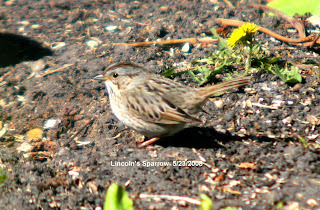 The Lincoln Sparrow is a transient that spends about three weeks in our area each spring from the last week of April to the first two weeks of May. Times vary depending on the spring. Then it moves further north to the Boreal Forest. It is a nondescript bird that normally would be very difficult to identify, but for one thing: the sparrows that usually come into our backyards are quite easy to identify because of good easily recognizable field marks. All the other nondescript sparrows such as Vesper, Savannah, Song and Grasshopper, are in the rural areas. The Lincoln’s is a bit of a skulker and sticks close to the ground much like a mouse would. At this time of year even its skulking habits cannot prevent it from being seen as there is very little cover. Like other sparrows it does like to scratch in leaf litter to uncover food. With a little practice it is quite easy to identify. Binoculars are a great help, here! It has a quite distinctive grey face and side of head with a brown streak running through the eye. A head on view shows a grey crown line running lengthwise through a brown cap. Occasionally, it will sing around here. If it does, it will be perched on a branch only a foot or two above the ground. Its song resembles that of the House Wren. Listen for it. Meanwhile, enjoy the arrival of the transient and summer birds. Some are here already and the rest will be flooding in shortly. My intention was to write about parrots, but I am home as of this writing and felt compelled to write about something else. The parrots will have to wait until next year. Instead, I am going to write about sightings of very rare birds – confirmed sightings that never should have happened. I will be dealing with three birds that never should have been where they were observed. This week’s article will have two photos – the Bridled Titmouse and the Black Throated Magpie Jay. I do not have a picture of the Painted Bunting. 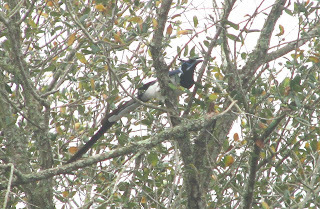 The Black Throated Magpie Jay is a non-migratory resident of southwestern Mexico. It never comes near the US border. Yet, here it was in southern Texas about 1500km out of its range and on the wrong side of the continent. How did it get there? Birders are unanimous in believing that the jay was a caged bird that escaped or was released. Not only is this jay non-migratory, but it is a social bird that lives in family groups. There is no chance that a solitary jay would make a long flight like that. The Magpie Jay is a handsome bird that really does closely resemble our Magpie in size and shape – hence the name. The jay is considerably larger with an overall length well beyond two feet; our Magpie’s overall length is well below two feet. However, in observing this jay, I could not make this distinction. When perched, the jay has a noticeable crest; the Magpie does not. In flight, a Magpie’s tail feathers move with the body. There is no noticeable tail movement. On the other hand, the jay’s tail feathers are quite flexible and flutter as the bird flies – much like holding a streamer outside a moving car window. The next two birds, whose ranges are limited to the southern US, have recently been observed in Saskatchewan. A few years ago, the sighting of a Painted Bunting (the first in Canada) made the local TV news. I remember a radio interview with a woman from Kelvington who had seen the bunting. As I recall, she did not report it at first for fear of ridicule, however, after hearing of sightings further south, she decided to report hers. The sparrow sized Painted Bunting is considered to be North America’s most gaudily coloured bird complete with red, blue, green and yellow. Other people consider it North America’s most beautiful bird. I have never seen one, so I do not have an opinion on that topic. For a more detailed description, check with your (or anybody else’s) bird book. It is only moderately migratory with its northern limits in southern Kansas. 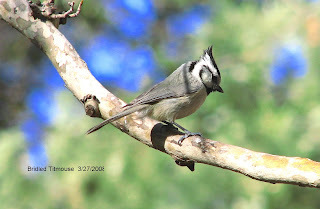 Similarly, the Bridled Titmouse caused quite a stir in the birding community when it was observed in Moose Mountain Provincial Park near Kenosee. This little, non-migratory “crested chickadee” is a resident of southern Arizona and New Mexico only. It is a grayish bird with a whitish face and striking black facial patterns that look like a bridle – hence its name. However, it was about 3000km out of its range! One birder who reported the event stated, “It had a lot of help getting here”. The same could probably be said of the Painted Bunting. Unfortunately, we can never be sure of why or how the birds got here, unless the culprits own up to it – which is highly unlikely. Even though these very real sightings do not count as official sightings, it is still nice to see a strange bird in somewhat of a natural habitat behaving naturally, rather than in a cage.